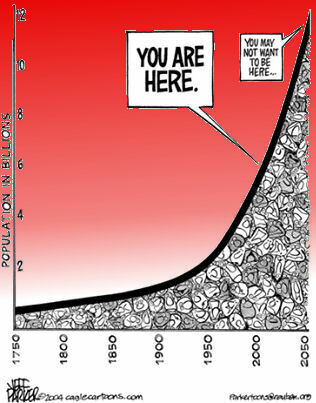 Human Population Growth Challenges Global Carrying Capacity. The major premise of sustainable growth is that there must be a balance among population growth, economic growth, and the carrying capacity of planet. May 27, 2016—-Carrying capacity is a biological concept. It is the limit to the population size of a given species the environment can sustain without damage to the environment. There is, for example, a limit to the size of a herd of elephants that the Serengeti Plains in Africa can support without the herd damaging the ecosystem. Carrying capacity for a species can, and often does, change over time. It can increase or decrease due to changing climate. If annual rainfall increases over time this may increase the food supply for some animals. It may decrease the food supply for others. The same is true when temperature changes. The size of a population may increase or decrease, depending on reproductive rates. Overpopulation can damage the ecosystem and reduce the carrying capacity. The ultimate limit to carrying capacity on the planet is tied to photosynthesis. This is the limit of the ability of green plants, algae, and bacteria to convert solar energy to living organic matter. You may not want to be here! A fundamental question for us is to decide if there is a carrying capacity of Earth for the human species. “Limits to Growth” by Paul Ehrlich was perhaps the first major statement that recognized the problem at the global scale. The basic premise is that there is an upper limit to the sum of population growth, food production, and economic productivity. There is growing support for a global policy of sustainable development. The major premise of sustainable growth is that there must be a balance among population growth, economic growth, and the carrying capacity of planet. Sustainable development must provide a balance between the needs and desires of the present generation, and yet protect the carrying capacity of our planet for future generations. In planning for the future, we cannot consider the environment alone, or human needs alone. Economic growth and environmental stability are inextricably linked. Sustainable development recognizes that there are limits to human population growth and economic growth. There are a group of academics, mainly social scientists and economists, that argue there is no carrying capacity at all–that there is no limit to population growth! They base their argument on the fact that, in the past, all projections of shortages of food, energy, and other resources have failed to materialize. These academics say we have always been able to find substitutes for items in short supply. They say we have always been able to increase food supply to not only keep up with the growing population, but to meet a satisfactory level of nutrition. They continually point to the Malthusian doctrine as being not only scientifically but morally wrong. 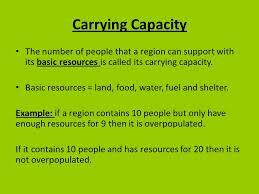 What is the Carrying Capacity of Our Planet? What the carrying capacity is for the planet for the human species has been studied extensively in recent decades. The result is that there is no fixed number of people attached to the carrying capacity, but with a lower population, the better the quality of life is going to be in the future. This quality of life is also dependent on the food we are able to grow to feed future populations. We can make choices about the level of food intake and the economic level at which we wish to live. All technological developments, from the early use of stone tools and fire to the invention of fracking, cause change in our environment. What the sustainable population may be, in which world resources are distributed equally, is not known. The estimates vary widely—from four billion to 16 billion. If the carrying capacity is actually near the lower estimate we are in deep trouble as the population is already over seven billion. Even a cursory look at the extent of malnutrition, migration, poverty, and violence suggest that we are well past the sustainable level! 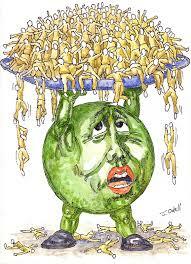 Categories: Global warming and its effects on animal population, Population, Poverty | Permalink.